During one of our recent LeanWeek implementations with a builder (let’s call the company Exceptional Homes), it was the mason’s turn to present ideas for reducing waste in product and process. Carlos, the owner, had some impressive solutions. One was to remove the 10 hidden courses of brick underneath the full-length front porches on several of the builder’s models that were recently redesigned from plain-Jane to Craftsman style. Jose, the lead man Carlos had brought with him, exclaimed, “¡No puede verlo!” which translates to: “You can’t see it!” Simple. Done. Total value exceeding $300 per unit (a bit more than one cube of brick plus labor). Everyone shook their heads wondering in disbelief how on earth they’d missed this. There were other great insights, including eliminating a pricey lintel and removing brick ledge from walls showing no brick. Then, with about 10 minutes to go, Carlos said he had one more small item to discuss regarding missing block, brick, and stone on this builder’s high-style homes. Exceptional Homes had a wide variety of plans with the typical three or four elevations for each. Employees, suppliers, and trades alike complained how plans changed on a whim—often before anyone got really good at building them. Sometimes the house was just missing a standard type of material, but often it was a specialty item needed for an elevation or an option, be it standard or custom. Carlos valued this as 15 minutes of time to make the call, worth about $15, and probably the same for the Exceptional Homes’ superintendent to track it down. Total waste valued at $30 per occurrence. How often did it happen? Carlos said it wasn’t too bad, only about half of the 250 units this builder closed the previous year. Half? Not too bad? It’s not unusual to hear trades pronounce similar failures happening on half of a builder’s homes as “not bad.” It’s such a common occurrence that they just accept it as business as usual. At first glance, $30 waste per home on 100 homes, or $3,000, may not sound like a huge amount, but eight or 10 items like this add up to real money. Consider how many similar things are going on with other suppliers and trades. Think about foundations, framing, roofing, mechanicals, drywall, paint, siding, cabinets, flooring, landscaping, etc. If Carlos finds a mistake on 50 percent of the homes, what will you bet the other suppliers and trades find? Something similar? In our experience with the 200 or so Lean implementations we’ve done, the answer is, virtually always. What one supplier or trade experiences is generally true across the great majority. So if that’s accurate and the average builder engages between 25 and 40 suppliers and trades for each unit, you’re looking at a healthy—or should we say unhealthy—six-figure sum. And here comes your nightmare: This number is grossly underestimated. 1. Mason on site discovers decorative keystone is missing from Plan 2515 Elevation C.
2. Two of mason’s crew members stop working. 3. Mason calls superintendent to resolve. 4. Superintendent checks plan, specifications, calls construction manager to resolve. 5. Construction manager calls Purchasing to resolve. 6. Purchasing checks plan, specifications, POs (purchase orders), and then calls supplier to resolve. 7. Supplier checks plan, specifications, POs, internal order sheet, load sheet, and determines that keystone is on back-order because it wasn’t a common specification. 8. Supplier finds documentation that notice was sent to builder regarding back-order delay. 9. Supplier calls Purchasing with update. 10. Purchasing calls construction manager with an update. 11. Construction manager calls superintendent to give an update. 12. Purchasing investigates why back-order notice was internally missed (and makes note to counsel Design about selecting nonstandard decorative keystones). 13. Superintendent calls mason with update and asks what can be done. 14. Mason suggests using an alternate, more commonly available, keystone. 15. Mason calls his office to track down the order number for the new keystone, which he recalls from a plan on a previous job for another builder. 16. Mason’s office staff searches for new specification. 17. Mason receives call from office with new specification. 19. Superintendent calls construction manager. 20. Construction manager calls Purchasing. 21. Purchasing calls Design for approval. 22. Major debate ensues between Purchasing, Design, and Construction on whether substitution is acceptable. 23. VP of construction gets involved, subsequently intervenes, and overrules Design concerns, citing schedule. 24. Purchasing creates variance purchase order—VPO, also known as an EPO (extra purchase order), FPO (field purchase order); that is, anything not included in original “start package” for specifications and options. 25. Purchasing sends VPO to supplier with rush order for next-morning delivery to jobsite at extra cost. 26. Purchasing calls construction manager with update. 27. Construction manager calls superintendent with update. 28. Superintendent calls mason with update. 29. Mason puts one guy on cleanup, one guy helping the other guys laying brick, but loses 2 hours of time on each. 30. Supplier locates keystone, arranges early-morning rush delivery. 31. Supplier asks for a VPO and creates invoice for special order and delivery. 32. Supplier sends email wondering whether to change the specification ongoing, cancel the special order, or …? 33. Purchasing receives email and puts it in the “follow-up file,” which is running a month behind. 34. Special order received at supplier and put in hold-for-processing area. 35. Another email sent to Purchasing asking for clarification. 36. Mason finishes next day and sends an invoice for 2 hours of lost time. 37. House complete two months later. 38. Three months later, VPOs for original special-order keystone, replacement item, special delivery, and lost time remain unpaid. Emails continue. 39. One year later, special-order keystone sits on a back shelf in a warehouse. Order processor for supplier picks it up and says, “Wonder what this is for ... .” He puts it back down and moves on. 40. Oh, and no one told the customer about the change, but the customer noticed, generating another 10 phone calls. Add those calls, and let’s call it 50 steps—and now the notion that fixing the recurring problems only takes about 30 total minutes seems ludicrous. The truth is, it got far worse. During the day, several members of our team inserted a few more steps that occurred to them, but that was after I’d taken the photos of the flip chart and ... you get the idea. We got so involved in the discussion that we didn’t have time to cost it all out, but later one team member worked it further and revealed that the 40-step sequence would cost an absolute minimum of $500 and could easily exceed $1,000, depending on how much research was required, how many people got involved, and how long the discussions leading to resolution took. All of this, for just one VPO. Home building nightmares don’t get much worse. So how many VPOs do you run per house and how do you count them? Comparing builder to builder is tricky at best and often misleading because there are many ways to quantify and track work done outside of the original house cost. Most methods have at least some logic behind them, but to be sure, many are inadequate, to put it kindly. For example, if you have multiple items for one supplier or trade, such as a cabinet company, coming back to fix trade damage, bring a finished end panel that was missed, and replace a door deemed off-color, is that one VPO or three? I’ve seen it done both ways. The first is simpler, but the second captures more data. Or if you have multiple trades required to resolve an issue, are all on a single VPO that’s sent to everyone, or does each trade get its own VPO? 1. Superintendent evaluates problem and notifies all suppliers and trades. 2. Mason removes half-level brick where door will go. 3. Sider removes fiber-cement siding above the brick up to the door height. 4. Framer opens up wall. 5. Lighting supplier drops off exterior fixture. 6. Electrician reruns wires to exterior outlet in the way and wires switch and door light fixture. 7. Plumber moves gas line from meter running through that space to the rest of the house. 8. Drywaller returns three times to replace and finish drywall that was removed to rerun plumbing and electrical. 9. Supplier brings out door. 10. Lumber company drops off trim. 11. Hardware supplier drops off door handset. 12. Trim carpenter hangs door, installs trim. 13. Ready-mix truck delivers concrete. 14. Concrete finisher finishes door stoop. 15. Mason returns to finish door opening. 16. Sider returns to replace excess siding removed for mechanical work. 17. Electrician returns to trim out switch and light. 18. Painter returns (twice) to touch up siding. Counting the multiple trips from the paint and drywall trades, that gives us more than 20 trips in total. Now add the management and admin costs. We have at least 15 times that the superintendent stops by to check and coordinate the activities of all the suppliers and trades. Then there are the multiple VPOs that must be drawn up, approved, and issued. When I set up the example and ask groups to guess the cost to make it right, most estimate $1,000 or less. After the detailed breakdown, they all buy in to the minimum $2,500, and probably closer to $3,000, it took to actually install the door. Be honest. How many of you are living this bad dream right now? Are you counting the full impact of that one measly VPO, which on the surface appears mundane? 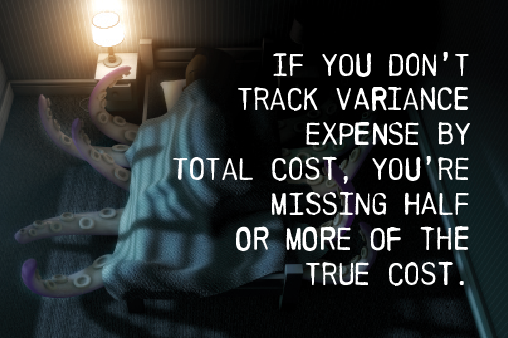 Do you really track the total cost, not just for you, but also for your suppliers and trades? You want to beat the trade shortage? Start right here. Eliminate the VPOs and you become much easier for trades to work with, far more efficient, and significantly more profitable for them—and you. Like many of the things I write about, you can’t manage this by memo. You can’t send out an email and expect anything to change. There are specific things you must do, going back upstream to examine all of the issues that created the VPO in the first place. In some cultures, this will be a terrific challenge. 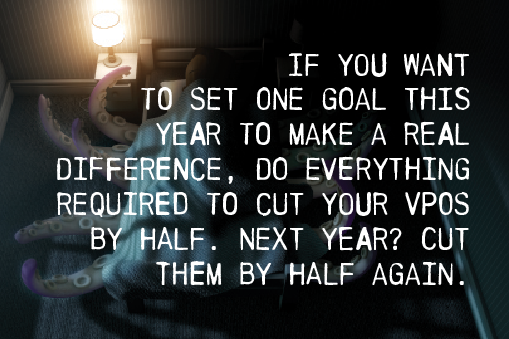 In fact, that would be a great exercise for you to do with your team this month. Take 10 ugly VPOs. Thoroughly cost them out—by total cost. Now trace them upstream to their sources. That will provide about as much education with direct cost-benefit as you’ll ever get out of a day’s work this year. If you’ve already done this and repeat it each year, please call or write to tell me what you found. If you haven’t, well, good luck convincing me you truly care about reducing your cost and increasing your profit. Next we’ll talk more about how to count and quantify the VPOs—how to get those processes to “talk to you.” We’ll explore the diversionary tactic of “convenient classification,” which confuses the numerator in your VPO measurements, and the artful strategy of “clever manipulation,” which makes a mess out of your denominator. Meanwhile, go easy on the spicy food just before bedtime. That’s known to cause nightmares, and something tells me you already have as many as you can handle. For a free PDF of the article series about better building practices to limit waste, email your request to info@truen.com. The Sinking of a Home Builder—Is that low VPO percentage you brag about a reality? Grand Theft Home Building—What's stealing from your business and beating up your bottom line?